Scientists have observed an “unprecedented” event that could lead to an end of seasons as we know them, after Northern Hemisphere jet streams crossed the equator and linked with others in the south. Usually separated entirely from each other by the equator where warm air acts as a barrier, both the Northern and Southern Hemisphere consist of jet streams made up of either warm moist air or cold dry air. Good God. 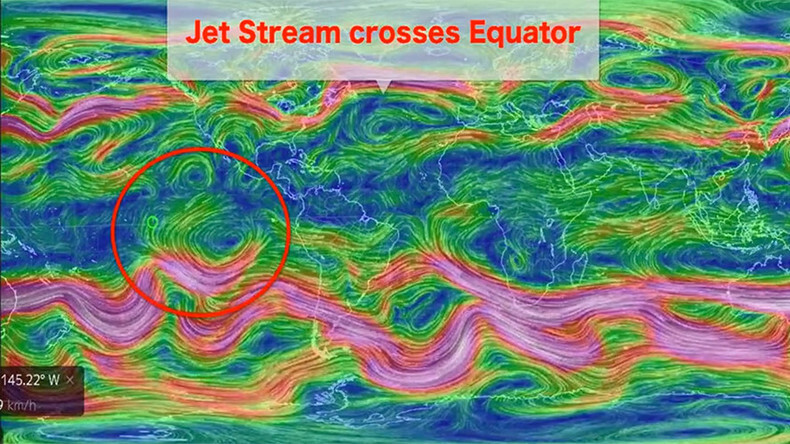 Northern jet stream just crossed the equator. And ignorant climate change deniers have no idea what I mean or why it's terrifying. The streams usually run from east to west but new data shows that the Northern Hemisphere’s streams have changed path and linked with streams in the south. “Welcome to climate chaos. We must declare a global climate emergency” warned Paul Beckwith, a climate scientist from the University of Ottawa, when analyzing data from Earth Nullschool. Beckwith was alerted to the data by a blog post from environmentalist Robert Scribbler, who said the warming of polar air due to “human-forced climate change” was flattening the atmospheric slope from equator to pole, allowing the streams to deviate. A “death of winter” scenario could occur according to Scribbler, where summer heat occurs in winter and vice versa. Not all scientists have agreed with this summation though, with Meteorologist Marshall Shepherd warning that the new data would require proper vetting before he could give an informed opinion.